Director Niki Caro has shared a BTS photo from Disney's live-action Mulan remake. Production just kicked off recently on this long-awaited new take on the animated classic under the direction of Caro, who is known for her previous movies such as Whale Rider and The Zookeeper's Wife. She also worked previously with Disney on McFarland USA. Still, this is by far her biggest production to date. That said, based on this new image, it looks like she's taking to her new Disney blockbuster gig quite well. The gorgeous behind the scenes image was shared by Niki Caro on Instagram as day one of filming wrapped up. 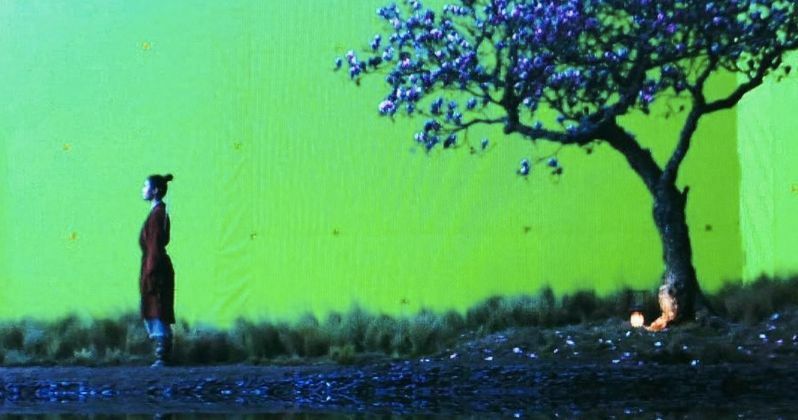 There is a stunning set near a lake, featuring who appears to be Yifei Liu as the titular hero. There is quite a bit of green screen surrounding the set, meaning that digital effects artists are going to fill that all in later with some presumably beautiful scenery to match what's going on in the shot. Even with all of the green screen still in place, it looks pretty fantastic. This is our second official look at the live-action Mulan. As production kicked off, Disney shared an official image of Yifei Liu in costume, looking pitch perfect. It was also announced at the time that Rosalind Chao, Cheng Pei-Pei and Nelson Lee had joined the cast. They join an ensemble that already includes Yoson An, Donnie Yen, Jason Scott Lee, Utkarsh Ambudkar, Ron Yuan, Tzi Ma, Chum Ehelepola, Gong Li and the legendary Jet Li. Those who were worried that this might become a whitewashed affair need not be concerned. It looks like Disney is going to at least try and do this thing the right way. Disney has found a great deal of success in recent years, starting with Tim Burton's Alice In Wonderland, with live-action remakes of animated classics. Beauty and the Beast wound up being the highest-grossing movie worldwide in 2017. Coming down the pipeline on that front, they also have Burton's Dumbo, Jon Favreau's The Lion King, Guy Ritchie's Aladdin and Maleficent 2, which finally kicked off filming recently. This is something the studio is clearly going to keep doing until the money absolutely dries up. Like the 1998 animated feature, the movie will center on a young woman who masquerades as a man in order to fight Northern Invaders attacking China. The script for the new live-action Mulan comes from Rick Jaffa, Amanda Silver, Elizabeth Martin and Lauren Hynek. Prior to getting cameras rolling, the movie went through a fairly lengthy development process, which is probably why there are four different writers credited. Disney is set to release Mulan in theaters on March 27, 2020. We'll be sure to keep you up to date as more details on the project are made available. You can check out the new behind the scenes photo, courtesy of director Niki Caro's Instagram, for yourself below.